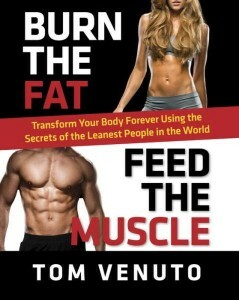 When I got the opportunity to get a copy of Burn the Fat, Feed the Muscle by Tom Venuto, I jumped at the chance! I loved the description of the book and couldn’t wait to get started. Sadly, it came during midterms and had to wait. I’m done reading now though and can give you guys my full opinion! The major theme for this book is that is contains the “secrets of the leanest, fittest people in the world.” You will see this repeated throughout the book as a regular theme. Don’t be fooled though, this book is not [just] for the already fit, it is for anyone looking to burn fat. The book contains many tips and “secrets” to getting lean – none of which I would consider to be a fad, a crash diet, etc. They are all helpful, accurate strategies to losing weight. The great thing about the plan in this book is not only the nutrition and fitness tips/plans he gives but also how to be successful at executing them. 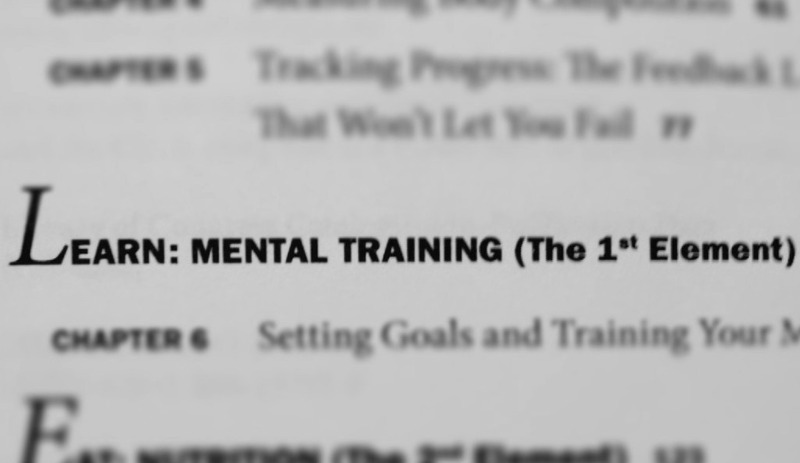 One of the chapters specifically attacks what he calls “Mental Training”. I think this is probably the most important chapter in the book and is what sets it apart from other fat loss books out here. In this chapter, he talks about how to stick with a plan in order to be successful. I think this is the part that most people are missing when they attempt to lose weight (and end up resorting to crash diets and fads). They just don’t know how to stick with it. Tom’s strategies are easy to follow and highly “motivating” so-to-speak (you are really just motivating yourself). This is the section of the book that sets it apart for me. This is of course a fat loss book we have to talk about food. Tom encourages a healthy relationship with food, encouraging healthy eating a majority of the time with treats here and there. He does tell you to be careful about how often those treats are, not letting them take up too much space too. He promotes an 50/30/20 macro-nutrient breakdown in the book. 50% of your calories from carbohydrates, 30% from protein, 20% from fat. To me, having read a lot of Paleo books, this seems a little low in fat, high in carbs (because its hard when you aren’t eating grains), but different ratios work for different people. Tom also says this in the book but still encourages the 50/30/20 rule. He doesn’t particularly discuss fat and carbohydrates as much (other than giving you reasons why too low or too high of either can be bad), but more emphasizes that you increase your protein intake. He discusses this topic in depth and even helps you calculate the number of grams you should eat on a daily basis depending on your goals. Remember I said this book was for everyone? He gives you approximate goals for your nutrition plan based on fat loss, maintenance, and muscle building. He pretty much has everyone covered. Of course, in order to figure out these percentages, you need to figure out your calories to consume each day which he also does thoroughly. He gives you different techniques, explains the differences, and suggests which are best based on your goals and current fitness levels. Phew! As a science/numbers gal, I definitely liked this part of the book. After much discussion about food types, macro-nutrients, calories, etc., he finally provides a sample meal plan to go along with all of the other information. There are two each provided for two different calorie ranges (labeled men and women, basically one higher than the other). One has a day’s worth of meals filled in while another has simple “protein”, “starch”, and “fibrous carb” filled in. 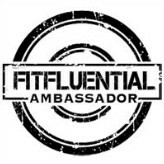 He gives you all the information you need to make a balanced meal plan from there! On top of that, he provides a few breakfast, lunch, and dinner meal suggestions that easily fit into his daily meal plan. 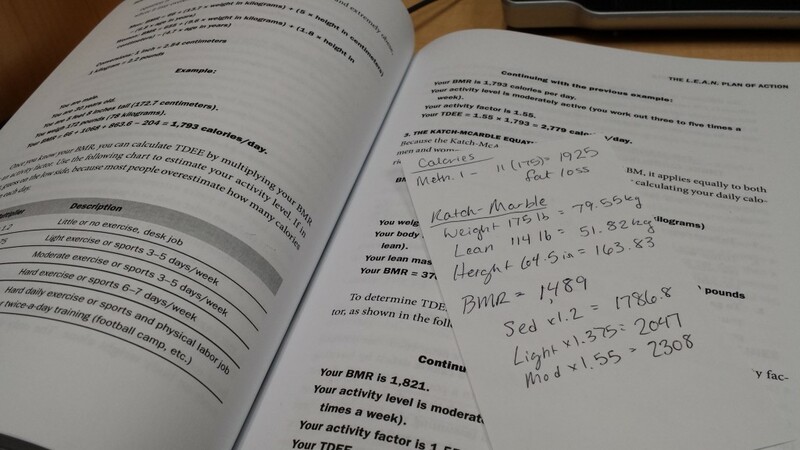 The last section of the book finally discusses the fitness aspect of burning fat. While Tom admits that a simple calorie deficit is the only thing necessary to lose weight, it is not the most efficient way nor the most desirable (you will be flabby). His goal is to burn fat while maintaining or increasing muscle mass. First, he discusses cardiovascular exercise (cardio). Here, he encourages that you do high intensity interval training in order to gain the most benefits for fat loss. He emphasizes the importance of resistance/strength training though over cardio when it comes to burning fat. He discusses why strength training should come as a priority over cardio and all of the benefits to your health and fat loss. There are two plans contained in the strength training portion of the book – one for beginner’s and one for experienced lifters. The one for beginner’s is for anyone who has not been lifting regularly for at least 3 months, even if you already know how to weight lift. Then of course, there is a plan for the more experienced. The great thing about these plans though is that they are completely customizable. He gives you a basic plan (and with the beginner’s plan, I would keep it as is for at least a few weeks) and tells you how to completely arrange it to better fit your needs without decreasing the benefits of the workout or changing it completely. You have to stay within the guidelines but you can basically reach any goal with his fitness plans here. Pretty much every useful and beneficial technique I have learned over the years of losing weight is contained in this book. This is the handbook of how to burn fat and get in shape in a sustainable way. There are little tiny things I might not have agreed with in the book but most of the information is so completely valuable, I am going to use it for years to come. Like I said earlier too, this book really is for anyone looking to get in shape. Whether you have 100 lbs to lose or 10, you can definitely use this book to reach your goals. 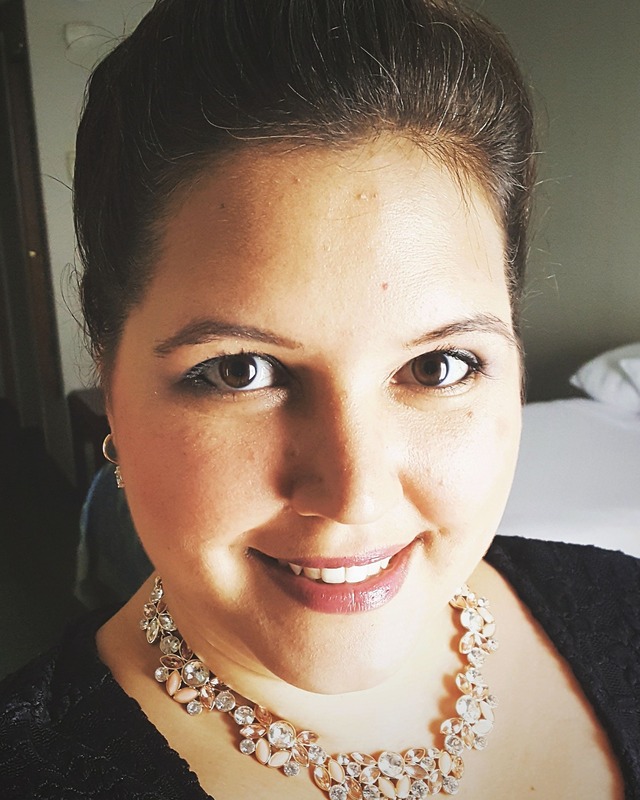 This is everything I wish I had known when I first started losing weight and had to learn slowly on my own from various sources. All the time, it was right here in Tom’s book. I wish someone had given me a copy in the beginning! Burn the Fat, Feed the Muscle is available for purchase December 10, 2013. Good info and breakdown from this book – I need more time to read! Interesting. I definitely have long eaten a bit lower carb, but that’s because I found it works for me. After doing metabolic testing it proved that I burn more fat and have to work pretty hard to hit carbs so I think like anything it’s another find what works for you. Completely agree! It changes so much from person to person. I was eating a high fat diet and was tired all the tired. 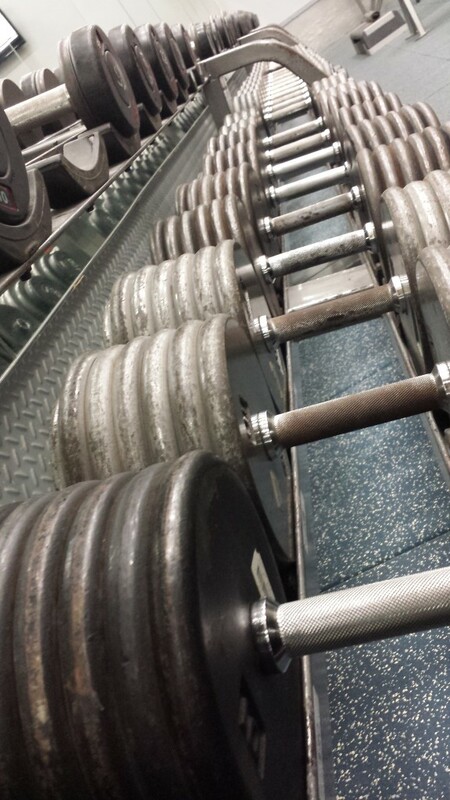 When I upped my carbs (and protein slightly), I found my mental sharpness came back. Essential when you are in graduate school!! sounds like a lot of great info!